solution, are provided for calculation of the responses to forces or motions exciting the structure. The new chapters in earthquake-resistant design of buildings describe the provisions of both the 1985 and 1988 versions of the UBC (Uniform Building Code) for the static lateral force method and for the dynamic lateral force method. 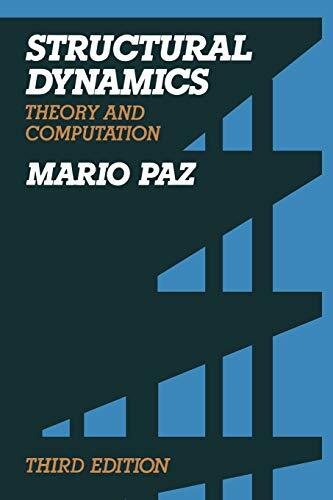 Other revisions of the book include the presentation of the New­ mark beta method to obtain the time history response of dynamic systems, and the direct integration method in which the response is found assuming that the excitation function is linear for a specified time interval. A modifi­ cation of the dynamic condensation method, which has been developed re­ cently by the author for the reduction of eigenproblems, is presented in Chap­ ter 13. The proposed modification substantially reduces the numerical operation required in the implementation of the dynamic condensation method. The subjects in this new edition are organized in six parts. Part I deals with structures modeled as single degree-of-freedom systems. It introduces basic concepts and presents important methods for the solution of such dynamic systems. Part II introduces important concepts and methodology for multi­ degree-of-freedom systems through the use of structures modeled as shear buildings. Part III describes methods for the dynamic analysis of framed struc­ tures modeled as discrete systems with many degrees of freedom.